For lovers of art and history, Narni offers an interesting occasion of a very-well organized visits thanks to the many subterranean places of Narni Underground. The visit is about the subterranean ancient complex of Saint Domenico's Monastery, started from the roman church, frescoed between XIII and XV century, which was discovered in 1979 by a group of young speleologists. Thanks to them and their work, all the underground structures of Narni Underground was revealed. 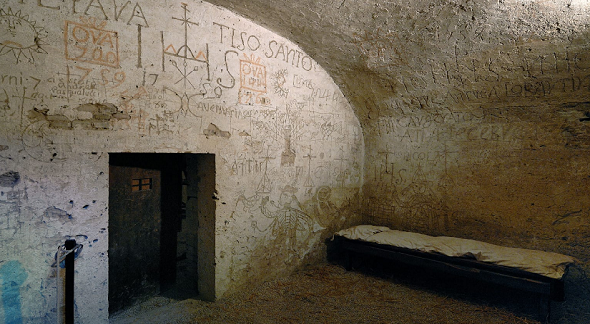 Among its spaces, you can admire the remains of a roman complex with a cistern, the roman aqueduct with the adjoining Lacus, a cell richly decorated with graffiti made by the prisoners of the Inquisition Court. The guided tour starts in the Monastery of Saint Domenico, coming inside the church that preserves some of the most ancient frescoes of the city. 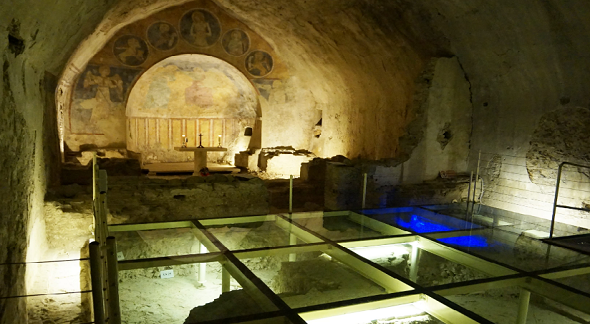 With the past excavations here, they found many important archeological remains that have been promoted with a special glass floor. Thanks to it, visitors can perfectly admire them. Visitors can also enjoy a simulated reenactment of the history of the ancient church, originally build on a roman temple. Crossing a gap opened in the walls, the visit proceeds to the space of an ancient roman house, whose we can admire a cistern. Then we arrive in the subterraneans of the roman aqueduct "Formina": thanks to a special installation, we can live a simulated walking through it, crossing Trafori of San Biagio, San Silvestro and Ippolito Mount. The complete visit to the acqueduct is a separate visit organized by Subterranea Association. It is the only roman aqueduct that is open in Italy and it has a path of 700 meters concluding with a spiral staircase, out from a cave of 18 meters. The visit is about 2:30 - 3 hours, only from May to October on Sunday and festive days with group of minimum 4-5 people and maximum 6-8 people. 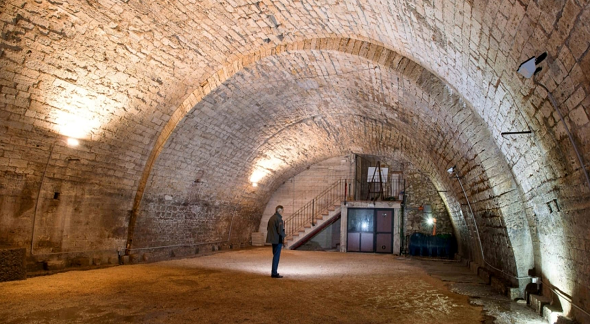 In additcion, under Garibaldi Square, there are a large Medieval cistern called Lacus, with stones vaults and floor of opus spicatum. Inside it, they are setting up a didactic space about the water and its importance for life. The visit proceeds in a large space, where there were the interrogatories of the Inquisition Court. In some documents from Vaticano Archieves and Dublin Trinity College, it was known as "agony room". The Inquisition worked in Narni at the middle of XIX century. In this ambiance there is also a unique cell: its walls are completely decored by signs and graffiti made by the prisoners. This cell represents a touching proof of theit pains. 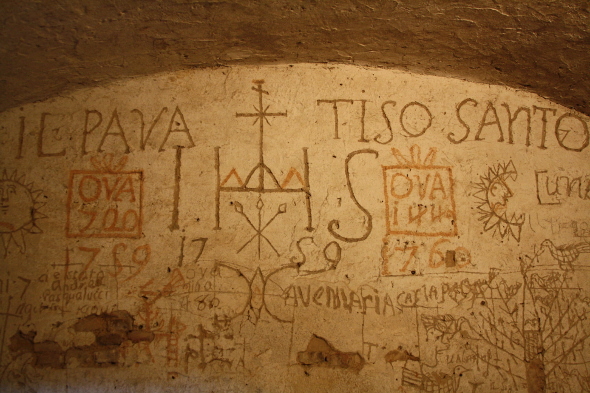 Without any object at their disposal, they used pointed fragments to realized letters, dates and symbols on the wall. In particular, Giuseppe Andrea Lombardini was a prisoner who spend about 90 days here between 1759 and 1760. He engraved words and symbols in a special language of Masonic and alchemical signs, to avoid that the message could be understood and eliminated by the inquisitors. Legends say that his ghost is still around the cell and the underground. From Monday to Friday: a visit at 12.00 and a visit at 16.00. The ticket costs € 6,00. There are reduced tickets at € 5,00 for groups of more than 20 people, at € 3,00 for young between 6 and 14 years old and at € 3,00 for students. Entrance for children under 6 years old is free. Couples and groups under 10 people have not to reserve. The booking is mandatory for group of more than 10 people; they can also reserve all days all times. Reserve your visit with Bella Umbria!